Team Borders runners add sparkle to a dull autumnal day. With the morning’s persistent drizzle gradually fading as racing got underway at Stirling University on Saturday at the first of the winter season’s East League cross-country races, the still and mild conditions proved ideal for good running. 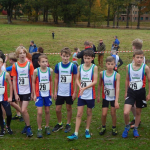 Although it remained dull there were some sparkling Team Borders performances to brighten the day, including three top-3 individual placings and four more top-10 finishes across the seven age-group races. Kirsty Rankine (Gala) was the first to record a top-10 finish in the U11 Girls’ race over 1.65km. She finished 9th in a time of 6minutes 45seconds in what was a very tight contest for placings outside the top three. Moorfoot’s Ava Mooney was only four seconds and five places behind, and newcomer Elise Field (Chirnside) completed the team in 49th, giving the girls 72 points for 8th place. Gala’s Ross Christie had a storming run in the U11 Boys’ race over the same course holding on well over the closing stages for 2nd place in 6 minutes exactly, only two seconds off the winner. Two newcomers, Luke Grieve from Moorfoot and Gala’s Morgan Fairclough, both ran well in the Team Borders vest for the first time and finished close together in the middle of the pack in 35th and 39th. That gave the U11 Boys’ team 76 points for 7th place. Also racing to 2nd was Gala’s Cameron Rankine in the U13 Boys’ race over 2.4km. In a mirror image to the finish of the U11 Boys’ race, Cameron re-appeared from the wooded section with 400m to go in 2nd place, not too far off the lead runner but with some pressure coming from behind. Responding to the challenge, he finished strongly to finish just five seconds off the winner in a time of 10.05. Good support from Chirnside’s Zico Field in 19th and Gala’s Archie Hendry earned the team 3rd place with 41 points. In the Under 13 Girls’ race, Isla Paterson (Gala) was the first of the three Team Borders runners home just inside the top-10 in 11 minutes 32 seconds. Holly Hobbs (Moorfoot) finished fast for 21st and her clubmate Sophie Logan completed the team in 51st for 7th place on 82 points. It was an all Gala team for the Under 15 Boys over 3.3km with Gregor Collins and Ewan Christie both well inside the top-10 in 7th and 8th with times of 11.24 and 11.28 respectively. After a late rallying call for a third runner, hats off to first-timer McKenzie Power whose solid run for 35th place saw the team finish 3rd on 50 points. The third individual podium place of the day came from Moorfoot’s Charlotte Clare in the combined U17/U15 Girls’ race. After a sensible steady start, Charlotte gradually worked her way through the field over the two-lap 3.3km course and emerged into view on the heels of the third placed runner as they headed into the final 400m. Using her track speed, Charlotte sprinted into a podium place on the approach to the line to finish in a time of 12.16. 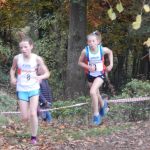 It was another 3rd place finish for the team with Beth Hobbs (Moorfoot) home in 16th and Anna Fairclough (Gala) running very well as a U15 for 24th for a team total of 43 points. The Under17 Men raced over a gruelling 6km and it was another all Gala effort for Team Borders with Lewis Tharme home in 13th pace, Jake Shepherd 28th and Sam McKInnon 31st. That saw the boys rewarded with 3rd place with 72 points. Well done to all, including those not mentioned above, particularly those racing for TB for the first time and gaining valuable race experience. It’s Broxburn for Race 2 on Saturday 24 November. Get that date booked in your diary and let’s see if we can keep some of the teams in a challenging position.